German parliament on Friday approved a plan to fine great example of such up to 50 million euros ($57. 04 million) if they fail to eliminate hateful postings quickly, despite problems the law could limit free manifestation. Is this German law empowers the government with such massive fine for the social networks to be fearful while writing on the net. Is this is an exercise to take speedy by the government to take action against rumour mongers. The German parliament on Friday approved a plan to fine social networks up to €50 million if they fail to remove hateful postings quickly, despite concerns the law could limit free expression. Germany has some of the world’s toughest laws covering defamation, public incitement to commit crimes and threats of violence. But few online cases are prosecuted. Edit"German Parliament tough law for social media"
French embassy and Institutes of French are making dedicated efforts for students across India with scholarship, sponsorship,training,participation for Indian students to study and participate in their national sports events. One such events are enumerated here for the benefits of the Indian students to prepare and compete globally. The Section for Science and Technology (SST) of Institut français India, French Embassy in India, is pleased to announce its support for IIT engineer Sushil Reddy, selected to participate as a Special Guest in the solar bicycle rally, “Sun Trip Tour 2017”. Organised by the French ‘Sun Trip Company’, the solar bike rally will take place from 8 to 21 July, 2017. It will pass through some of France’s most beautiful landscapes in the Auvergne-Rhône-Alpes region, and cross two neighboring countries, Switzerland and Italy. From a young age, Sushil Reddy has displayed deep commitment to promoting low-cost, clean, sustainable energy, both in his academic and personal life. He has contributed greatly towards this by using science, technology, education and tourism. A month prior to joining the Sun Trip Tour, Sushil embarked on his own Tour de France with his solar bicycle from 1st June to 2nd July 2017, again in a bid to promote the use of solar energy. Starting from Istres, his journey has led him to Toulouse, Bordeaux, La-Roche-sur-Yon, Rennes, Le Mans, Paris, and will finally take him to Lyon. In each city, he is holding seminars and meeting students in universities like Ecole Centrale, Instituts Polytechniques and HEC Paris, with fruitful discussions on the challenges of using solar energy. Renewable energy – and solar energy, in particular – is one of the key areas of the Indo-French partnership, involving academics, industry captains and other stakeholders from both the countries, who are collaborating in this fast-growing and promising sector. The Embassy of France in India, and its Science and Technology Sector (SST) under Institut français India (IFI), aim to ceaselessly develop cutting-edge cooperation in science, technology and innovation for the actors from France and India who share common interests and are interested in collaborating together. As a unique opportunity, stakeholders from India and France may benefit from CEFIPRA (www.cefipra.org), which provides financial incentives for organising joint seminars and workshops, and conducting collaborative research projects, including in public-private modes. Edit"French Embassy India, SST,support Sushil Reddy for “Sun Trip Tour 2017” in France"
India, stunned hosts England with a 35-run victory, also made it two wins from two as they overpowered the West Indies by seven wickets at Taunton on Thursday. Opener Smriti Mandhana got to three figures with an unbeaten 106 following her 90 against England. She added 108 runs for the third wicket with captain Mithali Raj (46) after India were in trouble at 33 for two chasing a modest 184. “Smriti played well for her hundred, it was a crucial innings she played,” said Raj. India´s spinners made life so tough for the West Indies that even the usually dynamic Deandra Dottin — holder of the fastest century in women´s T20Is — could manage a mere seven off 48 balls. The West Indies slumped to 91 for six before some late-order hitting boosted the total. All the eight teams involved play each other once, with the top four contesting the semi-finals. The final takes place at Lord´s on July 23. The Union cabinet today cleared disinvestment of debt-laden Air India but the final modalities, including the quantum of stake sale, will be decided by a group of ministers. Union Finance Minister Arun Jaitley said the cabinet has given ‘in-principle’ approval for disinvestment of Air India.A group will be set up to finalise modalities/details of disinvestment of Air India, including the quantum of stake sale, he said. The airline has a debt of more than 52,000 crore rupes and is surviving on a 30,000 crore rupees bailout package extended by the previous UPA government in 2012. Surviving on taxpayers’ money, Air India has been in the red for long and various proposals, including government think tank Niti Aayog’s suggestion for complete privatisation, have been made. The civil aviation ministry is charting out the disinvestment of the state-run carrier. Edit"Cabinet clears Air India disinvestment:"
‘Ek Haseena Thi Ek Deewana Tha’, presented by Shree Krishna International, is all set to release on June 30. Edit"Ek Haseena Thi Ek Deewana tha: an incomparable and fresh romantic thriller"
Indian shooting squad has finished a creditable second at the ISSF Junior World Championship with three gold, two silver and three bronze medals in Suhl, Germany. India picked up a gold and silver in the team and individual sections of the 25m pistol junior men’s event. India also won team bronze in the 25m pistol junior women’s event to shore up their tally on the fourth and final day of competitions yesterday. Anish Bhanwala won three medals, one of each colour. On day one, Anish had claimed gold in the 25m standard pistol men’s event. Yesterday, he win another gold teaming with Anhad Jawanda and Shivam Shukla for the 25m pistol event. Edit"India second in Junior Shooting World Championship"
The central bank has extended the scope of Banking Ombudsman Scheme. The Reserve bank said that under the amended scheme, a customer would also be able to lodge a complaint against the bank for its non-adherence to RBI instructions with regard to mobile banking/ electronic banking services in India. As per the amendment, the pecuniary jurisdiction of the Banking Ombudsman to pass an award has been doubled to 20 lakh rupees. AIR correspondent reports that the Reserve Bank yesterday extended the scope of Banking Ombudsman Scheme under which banks could be penalised for mis-selling third-party products like insurance and mutual funds via mobile or electronic banking. Banking Ombudsman is a quasi judicial authority functioning under the Banking Ombudsman Scheme, 2006. The authority was created to enable resolution of complaints of customers of banks relating to services rendered by the lenders. The gross fiscal deficits of all the states skyrocketed to 4,93,360 crore Rupee in the last fiscal from the 18,790 crore rupee in the financial year 1991, according to the latest RBI data. Most populous state Uttar Pradesh and the largest Rajasthan lead the list of states with highest deficit. According to the second edition of RBI’s statistical publication titled ‘Handbook of Statistics on States 2016-17’, released on Saturday, the gap is projected to improve in the current fiscal. It is estimated to be 4,49,520 crore rupee as per the budget estimates of the states for financial year 2017. The publication follows the ‘one-indicator-one table’ approach and covers all sub-national statistics on socio- demographics, state domestic product, agriculture, industry, infrastructure, banking and fiscal indicators across the states over a period ranging from 1950-51 to 2016-17. It also offers data on state-wise availability of power, per capita availability of power, installed capacity of power, and power requirement, length of national highways, roads and state highways, and railheads. According to the data released by RBI, banks’ credit growth grew at 6.02 per cent to Rs 76,58,212 crore in the fortnight ended June 9 from Rs 72,22,939 crore in the same period of fiscal 2016. The data showed that the growth in advances in the reporting period was slightly higher than the previous fortnight ended May 26, 2017. In the fortnight ended May 26, advances had grown by 5.08 per cent with an outstanding loans at Rs 75,93,546 crore. In the fiscal ended March 31, 2017, credit growth had plunged to a multi-year low of 5.08 per cent with an outstanding loan at Rs 78.81 trillion as against Rs 75.01 trillion on April 1, 2016. In the reporting fortnight, bank deposits grew at 11.19 per cent to Rs 105,77,947 crore from Rs 95,13,148 crore in the fortnight ended June 10, 2016. Edit"RBI amends Banking Ombudsman Scheme"
Prime Minister Narendra Modi returned home a short while ago from Amsterdam after a four day three nation visit to Portugal, United States and The Netherlands. During his visit, India signed eleven MoUs for cooperation with Portugal and three with the Netherlands. In USA, Mr Modi and President Donald Trump comprehensively reviewed bilateral relations and laid down the future road map. Our correspondent covering the visit of the Prime Minister reported that the Prime Minister’s visit focused primarily on four broad areas: one, furthering India’s strategic interests, two- projection of India as a country with fast track reforms coupled with high economic growth making it a strong opportunity for investment; third- seek collaborations in areas like skill development, knowledge based society and frontier areas of science and technology and four- reviving bonds with Indian Diaspora and seek their contribution for the development of India of their dreams. The first ever Modi Trump meeting reaffirmed close Indo-US relations with President Trump reiterating himself a true friend of India. India not only received full support in its fight on terrorism from the three countries but the US went a step further by calling Pakistan to put an end to terror. The visits saw increasing convergence of views between India and the three countries on major international issues. Edit"Modi returns Delhi after three nations visit"
US Vice President Mike Pence has said that his country will help the Indian armed forces to obtain the resources and technology it needs to support security in South Asia. He said the process to approve the sale was underway and expressed hope that it would accurately reflect commitment to mutual security among both nations. In a key note address to members of the US India Council in Washington yesterday, Pence said, the US and India can deepen their ties in many industries and areas. He urged India to enact the necessary economic reforms to ensure fair and reciprocal bilateral trade. He also said India and the US, are strong partners in fight against terrorism. He said, the United States and India already collaborate to a significant extent. But in the face of terror networks that are ever-more sophisticated, ever-more dispersed. He said, both countries will continue to take renewed action to facilitate two-way information and intelligence sharing to confront this threat. Edit"Mike Pence:US to help Indian armed forces SA"
Edit"No winner in Mongolia’s presidential election"
President Donald Trump officially nominated Christopher Wray as the new head of the FBI on Monday. Trump first announced his intention to nominate Wray three weeks ago, describing him in a tweet as “a man of impeccable credentials.” Wray formerly served as assistant attorney-general in charge of the Criminal Division at the Justice Department under former President George W Bush. During his tenure, Wray oversaw several major corporate fraud investigations, including the federal prosecutions of executives involved in the Enron scandal. Wray’s nomination must now be confirmed by the Senate. If he is confirmed, Wray will take over for Andrew McCabe, who has been the bureau’s acting director since Trump fired James Comey on May 9. In a statement released by the Justice Department, Wray said he was “honored and humbled” to be nominated. Edit"Trump nominate FBI director Christopher Wray"
The Netherlands has backed India’s early entry into the Nuclear Suppliers Group, NSG, and other multilateral export control regimes. In a joint communique issued after the meeting between Prime Minister Narendra Modi and his Dutch counterpart Mark Rutte in Hague the Netherlands also supported the country’s bid for a permanent UN Security Council seat. Both leaders agreed that the NSG, Wassenaar Arrangement and Australia Group would benefit from India’s membership. Prime Minister Modi thanked the Netherlands for its role in India’s accession to the Missile Technology Control Regime in June 2016. India and the Netherlands also strongly condemned the use of double standards in addressing the menace of terrorism, saying there can be no justification for acts of terror on any grounds. They expressed concern about the serious and grave threat posed by the spread of terrorism and violent extremism to both the countries and the world. Both leaders reaffirmed their commitment to combat terrorism and prevent radicalisation that could lead to violent extremism. Mr Modi also discussed the role of the Netherlands as ‘Gateway to Europe’ for India as 20 per cent of its exports to Europe enters through the Dutch country. Both leaders expressed hope for an early resumption of negotiations leading to the conclusion of the Broad-based Trade and Investment Agreement between India and the EU. Prime Minister Modi invited the Netherlands to join the International Solar Alliance. Prime Minister Rutte appreciated the lead taken by India to galvanise global action on Climate Change through the its initiatives. Both leaders reaffirmed their countries’ commitment towards Paris climate deal. Earlier yesterday, Prime Minister Modi described the Netherlands as India’s “natural partner” in its economic development and said the bilateral ties with the country’s major trading partner will grow rapidly. India and Netherlands also signed three MOUs on water management, cultural cooperation and on amending social security arrangement. The MOUs were signed in the presence of both leaders. Expressing that his Netherlands tour comes at a time when the two countries are celebrating 70 years of diplomatic relations, Mr Modi said the two countries have centuries old relations & are together progressing ahead steadily. Stressing that today world is interdependent & interconnected, he said, India & Netherlands have convergence of views on the global issues. Yesterday, Mr Modi also interacted with the CEOs of Dutch companies inviting them to utilize the vast opportunities provided by his ‘Make in India’ initiative. Prime minister Narendra Modi has said that everything the country have must be world class as the India of the 21st century cannot stay behind when it comes to technology and infrastructure. Addressing Indian diaspora at a stadium in South Holland’S capital the Hague, Prime minister stressed on larger community participation in development. Mr Modi said, India will have to be modernised at a greater speed. Addressing the diaspora the Prime Minister announced that five years business visa will soon be granted to the dutch nationals. Mr. Modi appealed all Indian origin people in Netherlands to apply for their Overseas Citizens of India, OCI, cards at earliest. Mr Modi praised the Sarnami Indians for maintaining Indianness despite being outside India for around 150 years. He said, despite migrating as labourers to American country of Surinam & then to Netherlands, the Sarnami community has maintained Indian language, culture and traditions. Emphasizing that relations of blood do not change with change in colour of passport, he said, Indian diaspora across world has feeling of an obligation towards India. The prime minister Citing the contribution of India’s women across all fields, the prime minister said his government aims at the women-led development. He said, his government’s thrust has been on jan bhagidari (people’s involvement) in governance as he believed that the country’s progress cannot be ensured only through the government’s work. Later, The Prime Minister left for home after concluding his three-nation tour of Portugal, the United States and the Netherlands. Edit"Netherlands Backs India’s Bid For NSG Entry And A Permanent UNSC Seat"
Edit"NMML Public Lecture_’Gender Dharma in Counter"
Union Minister for Social Justice & Empowerment Shri Thaawarchand Gehlot will visit Rajkot. He will attend Mega Camp to facilitate Divyangjans with Prime Minister Shri Narednra Modi on 29th June, 2017 (Thursday) at Rajkot. You are cordially invited to cover the event. Kindly make it convenient to send your reporter / correspondent / photographer / cameraperson for the same. Edit"Mega Camp to facilitate Divyangjans"
On 26th June, three journalists were arrested by the Burmese Army in Shan State. 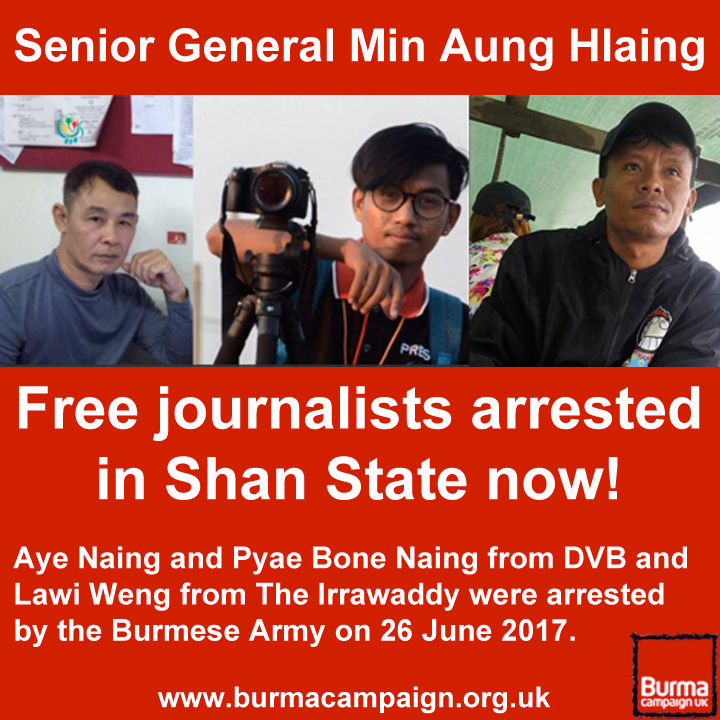 Lawi Weng, from The Irrawaddy, and Aye Naing and Pyae Bone Naing from Democratic Voice of Burma, have not been seen or heard from since then. Four other people were arrested with them. Tell Min Aung Hlaing, head of the military, to free the journalists now! The military don’t publish contact details, but Min Aung Hlaing’s staff are regularly updating his Facebook and Twitter accounts, and read messages sent to him on Facebook. Facebook and Twitter are the quickest way we can get the message to him. Send this campaign poster to Min Aung Hlaing. If you have a Facebook or Twitter account, please send Min Aung Hlaing a Facebook message with our campaign picture, and Tweet it to him as well. Min Aung Hlaing doesn’t want the media to report on the human rights violations committed by his troops in ethnic states. Don’t let him get away with arresting journalists and covering up human rights abuses. Edit"Three journalists arrested by the Burmese Army"
Plot: Some young folks, tired of the society they’re living in, plan a bomb attack over Paris before to take shelter for a night in a shopping centre. In this contemporary dance project, the French artist Cécile Loyer weaves together the stories and the histories of dance. “Histoires Vraies” is, first and foremost, an enquiry into the origins of movement and how movements are passed on. Having been intro­duced to bharathanatyam, Cécile Loyer creates a mix contrasting two different traditions and their use of the body. On the stage, 2 Indian dancers and 2 European dancers turn themselves into witnesses and nar­rators of their own stories. This bizarre, often funny, chaos of gestures narrates our ‘collective history’ and tries to capture the essence of what dance is and to see whether movements, gestures and signs can help us discover other versions of history – less tangible but more moving! Plot: A has-been actor takes a job playing the victims in a homicide re-enactment, where he sparks with the civil officer investigating the real-life crime. Ranganathan Trio is a presentation by a family: three brothers, three talents. Ajay, 22, playing piano, and the twins Ravi and Théo, 19, playing cello and violin. All three-started learning music at a very early age at a Conservatory in the city of Tours. Afterwards, they have continued their studies with famous professors in various Conservatories in France. Plot: Pierreffite-sur-Seine, 1980. Brahim, a 10-year-old, lives with his family in the construction factory of cranes. His father, of Moroccan origin, is the keeper of this factory. It is a period full of Novelties for the young boy. But at the plant, a relocation of the site is announced to the South of France. The factory closes and the family of Brahim must move elsewhere. Plot: Writer and philosopher Hannah Arendt (Barbara Sukowa) goes to Israel to cover Adolf Eichmann’s war-crimes trial for The New Yorker magazine. Tom Alter directs this philosophical drama drama about the perception of one’s own happiness through the story of an unhappy man and his upbeat. Enigmatic psychiatrist played by theatre personality DIVYA ARORA. About: ‘Dr. Khanna’, play written and directed by Padmashri Tom Alter, staring Divya Arora as the protagonist as she was the only actor in the writer’s mind when he wrote the play. Divya is a much remembered and loved alumna of the Alliance française de Delhi and Lady Shri Ram College for Women, Delhi University. Presently living and working in Mumbai, Divya revisits Delhi now, after becoming an actor, director, writer and a national awardee herself. Divya Arora interprets Dr. Khanna’s role in “DR. KHANNA” opposite Tom Alter, for a course of precise 45 minute doctor- patient appointment that starts, gradually through the puns of Galib’s famous shayaris. The formal barriers of a patient and his doctor melt into a camaraderie that the two begin to share. Cine club screenings are open to all. Free admission. Copyright © Alliance Francaise de Delhi, All rights reserved.